The angle from the sub-solar point to Cape Laplace must now be determined. Of course, to determine this angle, one must have the coordinates of Cape Laplace itself. Here, the coordinates of Cape Laplace from the center of the Moon will be determined. 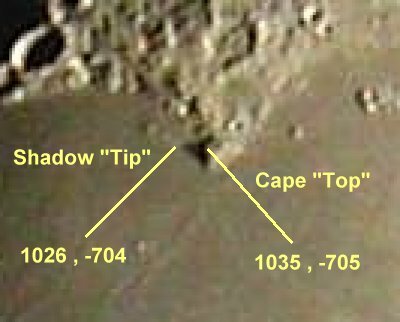 First, the location of Cape Laplace from the original image must first be measured. Here, we will also find the location of the shadow tip, since we will certainly require it later.